Mince and roast mushrooms in a garam masala spiced tomato sauce, served on roast potatoes. Potatoes & mushrooms: Place separately (potatoes on one half and mushrooms on the other) on a tin foil lined baking tray with a drizzle of olive oil and season with salt and pepper. Mix, arrange in a single layer (the stalks of the mushrooms should face up) and roast for 30 minutes until golden and cooked. Masala Bolognese: Place a pan on medium-high heat with a drizzle of olive oil. Add the onion with a pinch of salt and cook for 5 minutes before adding the steak mince. Season the mince generously with salt and pepper, break it apart with a spoon and cook for 3 minutes until lightly golden. Add the tomato paste, Curry Masala Spice Mix, garlic and ginger. Cook for 1 minute, add the tomatoes with water (½ cup for 4; ¼ cup for 2) and let it simmer (gently boil) for 10 minutes until the sauce thickens. Add a squeeze of lemon, the fresh coriander and season with salt and pepper to taste. 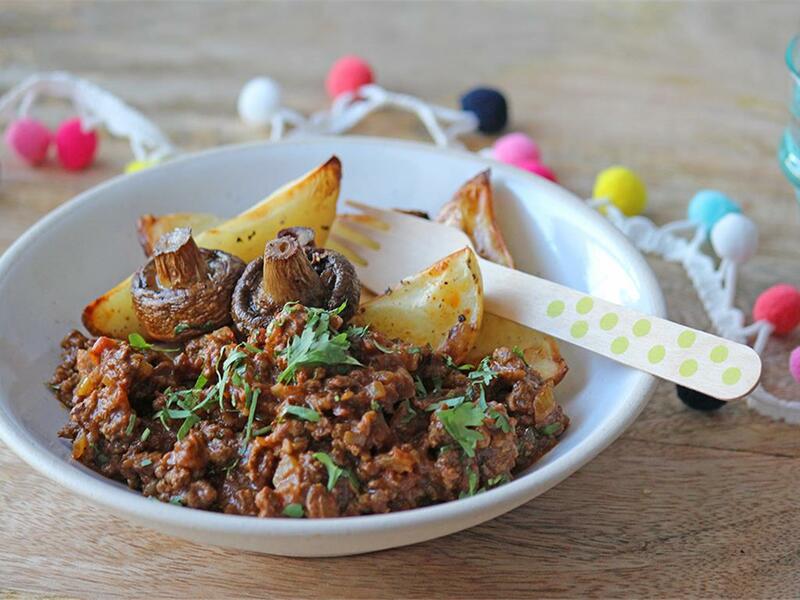 Serve the roast potatoes topped with the masala Bolognese and roast mushrooms.